Sweet, rich, highly-prized flavor, and great for the barbecue. Grown in the cool, pure waters of the Puget Sound. The Pacific Oyster is the most communally found oyster in the Pacific Northwest. With its distinctive black velvet rim around its meat, tasting sweet and rich with a slight hint of a cucumber finish. This oyster is enjoyed many ways here in the northwest. Eaten raw is a purist delight, and barbecued on the beach or at home is a tradition around here. Originally from Japan, the Pacific oyster is the most widely cultured oyster in the world. It is popular to farm because it is an extremely hearty animal that is simple to propagate, and its mild flavor is highly prized. They are sold under a variety of names, usually denoting their race or growing area. Formerly there were four races of the species Crassostrea Gigas, which occurred in different areas of their native island nation. Some races have vanished or have “lost” their genetic uniqueness, and currently, the only variety cultured along the U.S. west coast is the Miyagi, commonly referred to as the Pacific. Taylor Shellfish has three farms where Pacifics are grown. Heat a small saucepan over medium-low heat. When hot, add the olive oil and the butter. Add the garlic and saute until fragrant, about 30 seconds. Add the lemon juice, chili pepper flakes, salt, pepper, and parsley. Turn off heat. If you can find large, fat oysters, you can place the oysters directly on the grill grates. It’s best to wear long, sturdy BBQ gloves so you can handle the oysters by hand instead of using tongs, spoons or spatula. However, if the oysters are small and flat, you’ll run the risk of spilling its valuable, flavorful juices as well as the garlic-butter sauce. You can do what I’ve done, which is to place the oysters on a bed of rock salt or rice in a small pan — and then placing the entire pan inside the grill or under a broiler. This steadies the oysters and prevents them from wobbling. 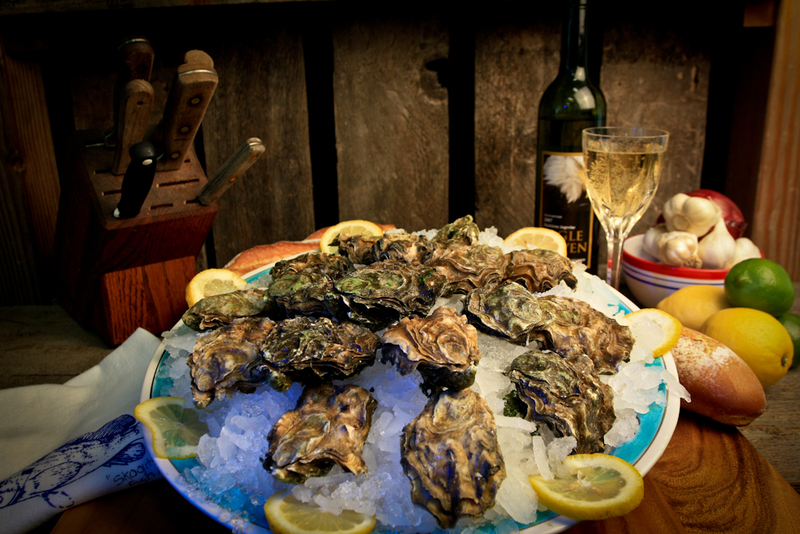 Place the oysters, cup side up on a very hot, preheated grill, cover and cook for 1 minute. The oysters should now be slightly open. Quickly remove the oysters. Hold an oyster with an oven mitt and use a shucking knife (or a clean screwdriver if you don’t have one) to pry open the oyster. It should easily open. Spoon sauce into each oyster and return oysters to the grill. Cover and grill 4-5 minutes.